To offer some consolation to the Turkish team that lost in last nights game against Germany in the European football championship and to the Turkish people living in Berlin, here`s a German band singing in Turkish. 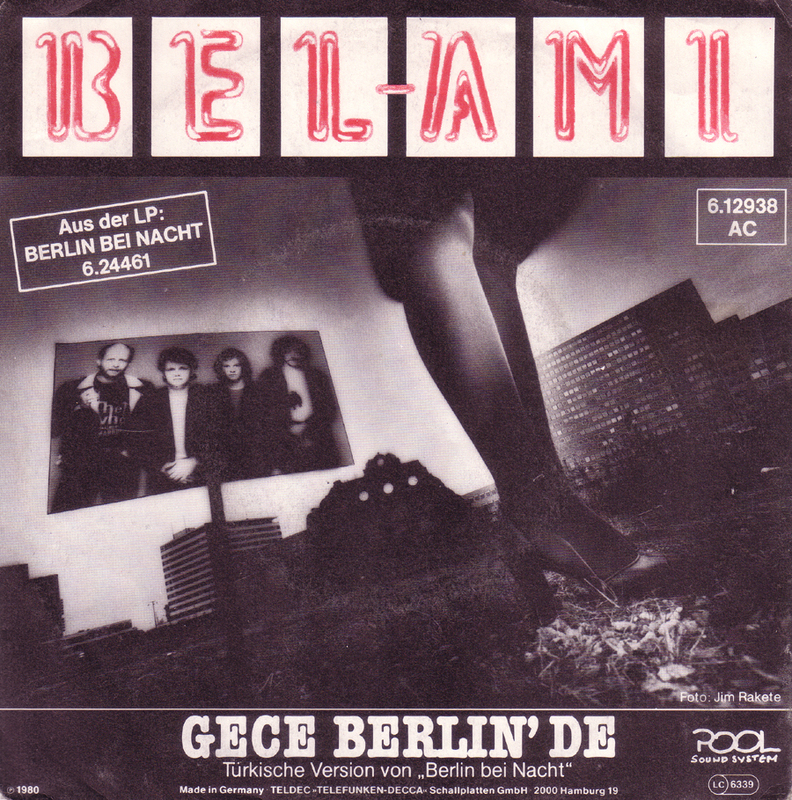 Bel Ami had a hit with “Berlin bei Nacht” ( Berlin at night ) and re-recorded the song in Turkish as a sign of friendship towards the Turkish people living in Berlin. 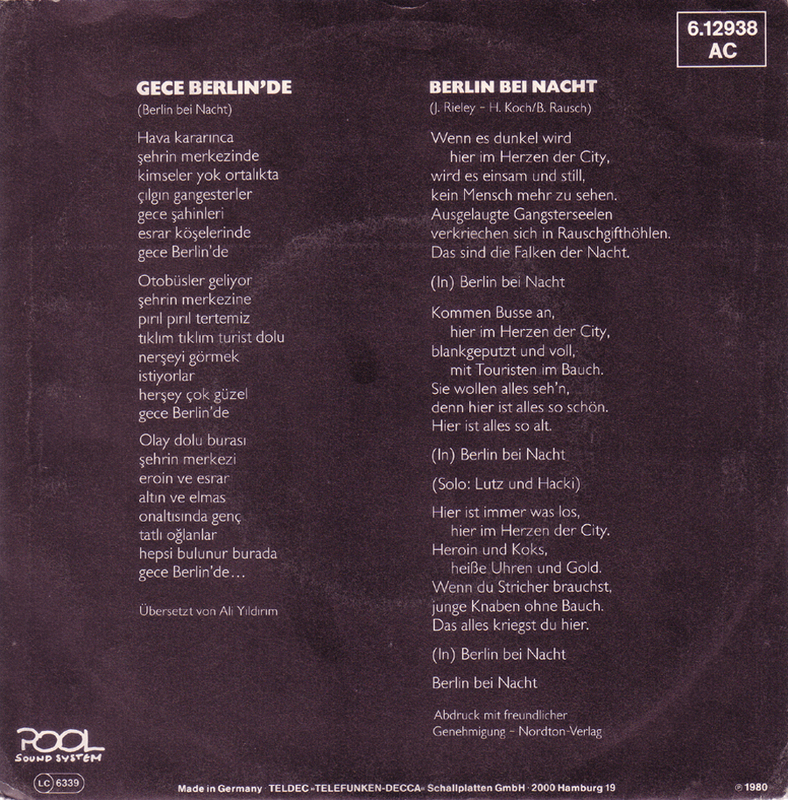 There were probably other groups who did the same thing, but the song “Gece Berlin`de” is interesting lyrically because it describes the Berlin of the 70s and 80s in quite drastic if also stereotypical ways. “Worn-out gangstersouls hide in drug-dens, these are the hawks of the night (…) There is always something going on, here in the heart of the city. Heroin and cocaine, stolen watches and gold. If you need male prostitutes, young boys without bellies. You`ll get everything here. Berlin at night”. I´m not a football fan but I must admit, that I had a lot of fun following the European football championship so far. Mostly we watched it at home with friends. Of course siding with the German team. 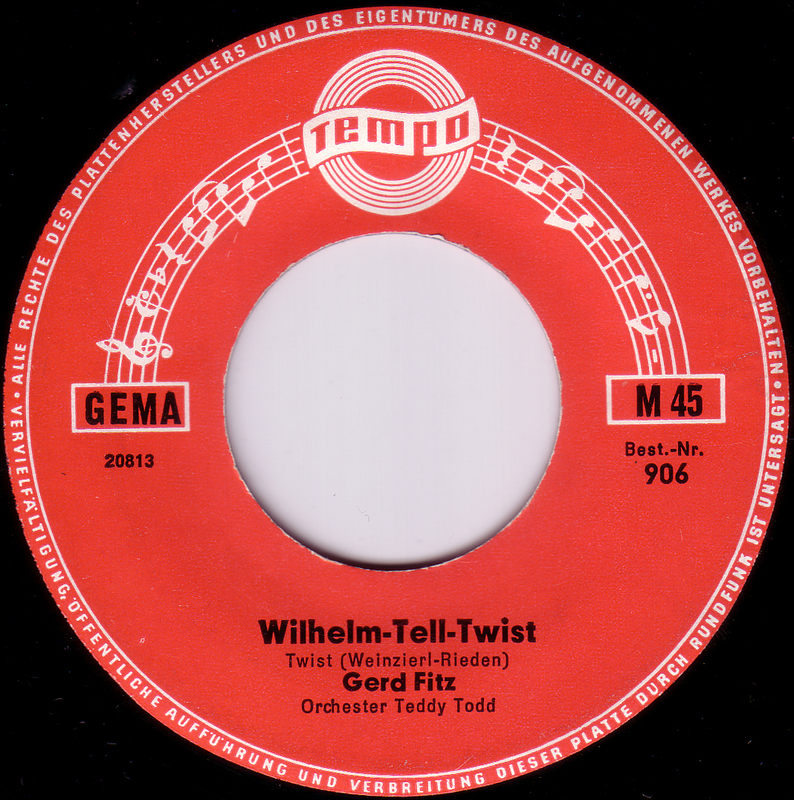 I don`t really care if they win the whole thing or not, but it seems fitting to post some more football related records from Germany this week. This one is sort of a historical document from 1988 uniting two Berlin teams “Hertha BSC” from the West and “1. FC Union” from the East on one record one year before re-unification. 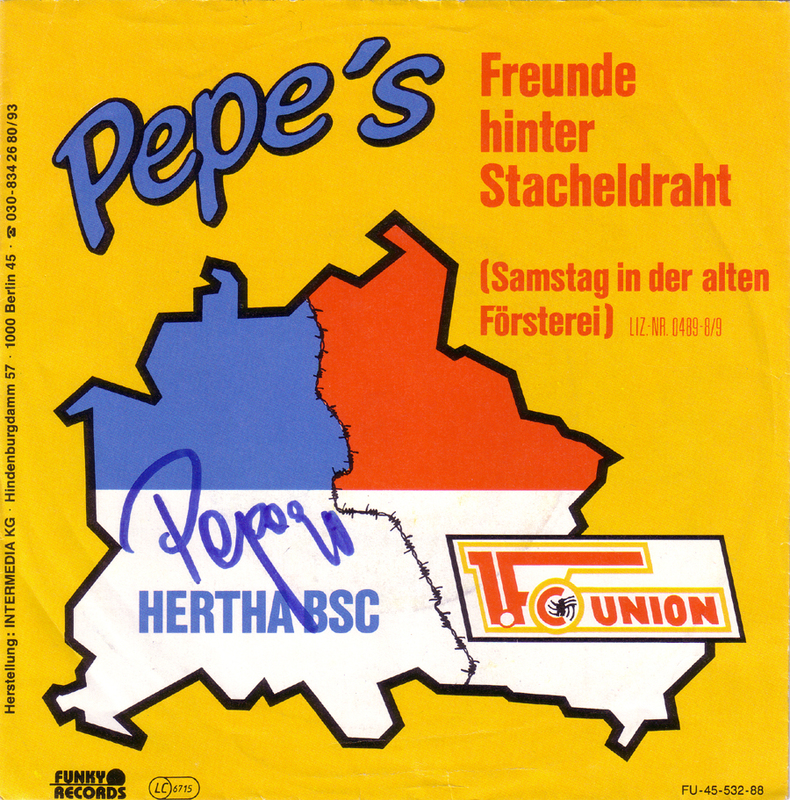 The title song “Freunde hinter Stacheldraht” ( Friends behind barbed wire ) is sung ( if you want to call it that ) by Peter “Pepe” Mager, owner of a “Hertha” fan-shop. 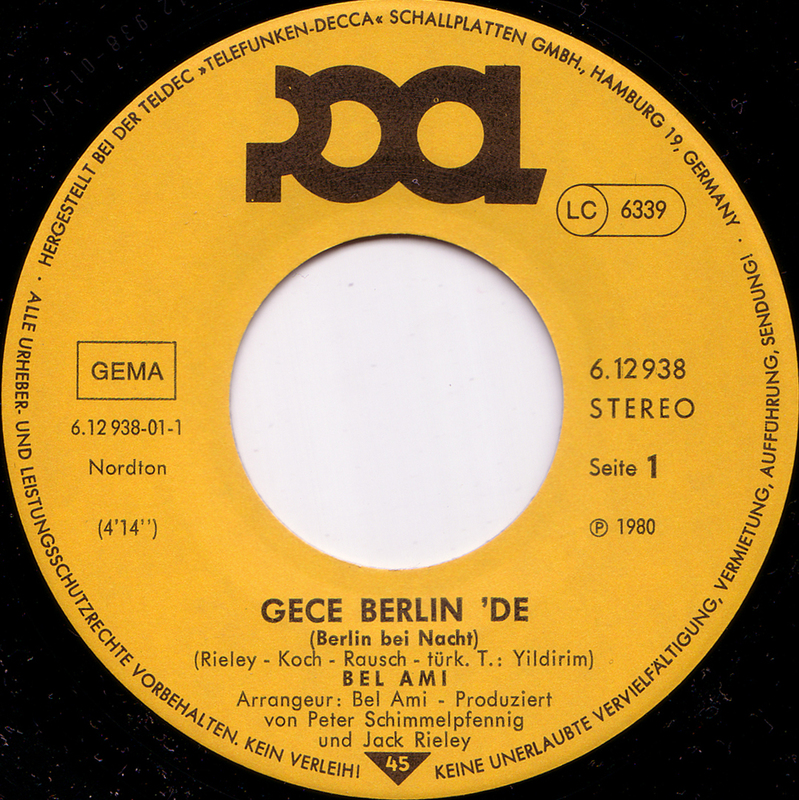 In the introduction of the song Pepe says in a typical Berlin, very matter-of-fact style: “Ich widme diese Platte allen Freunden und Anhängern von Hertha BSC und des 1. FC Union” ( I`m dedicating this record to all the friends and supporters of Hertha BSC and the 1. FC Union ). I`m pretty sure this record is a bootleg because the flip-side was originally featured on a East-German EP published by the state-owned label Amiga in 1985. There is no name credited to the song and to top it off the title is wrong. 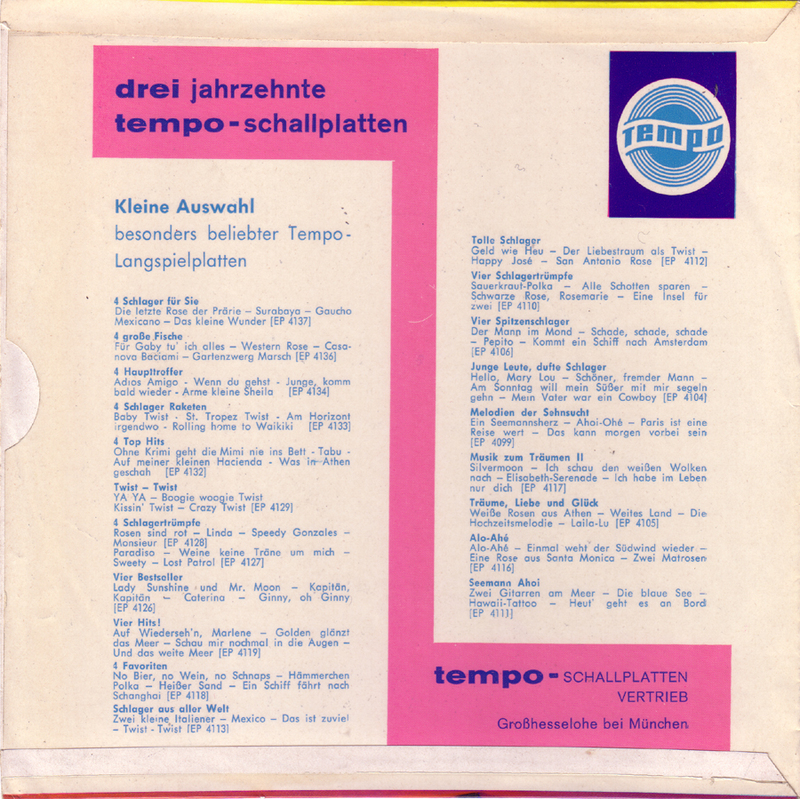 “Stimmung in der alten Försterei” was written by Harry Jeske and sung by Achim Mentzel and members of the “Union” team doing the chorus . Achim Mentzel is a well known East-German Pop singer, comedian and TV-host who is still working today, though still mainly for a East-German audience. 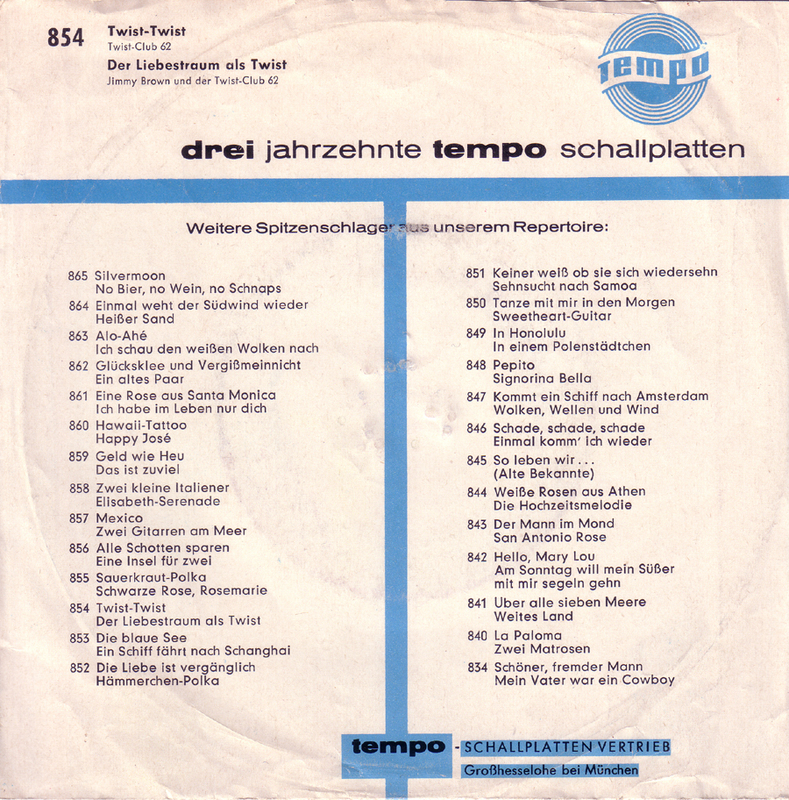 A interesting side note is that Mentzel started his career in the legendary East-Berlin Beat band “Diana-Show-Quartett” that got banned in the Beat-prohibition of 1966. So Achim used to be a rocker and it still showed in this song twenty years later. 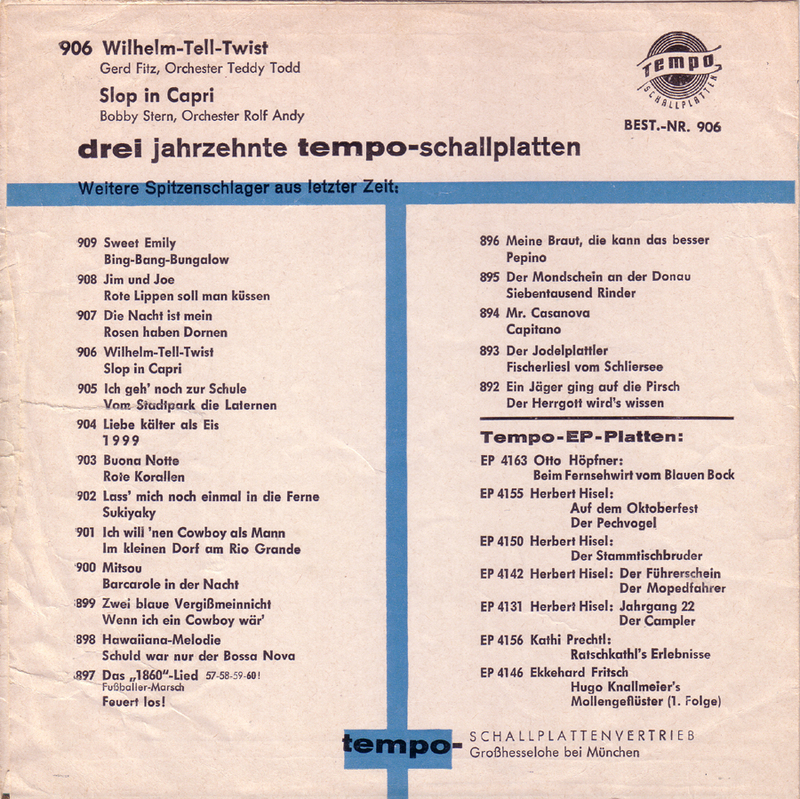 Typical East-German 70s or 80s Rock similar to the “Puhdys” and “City”. 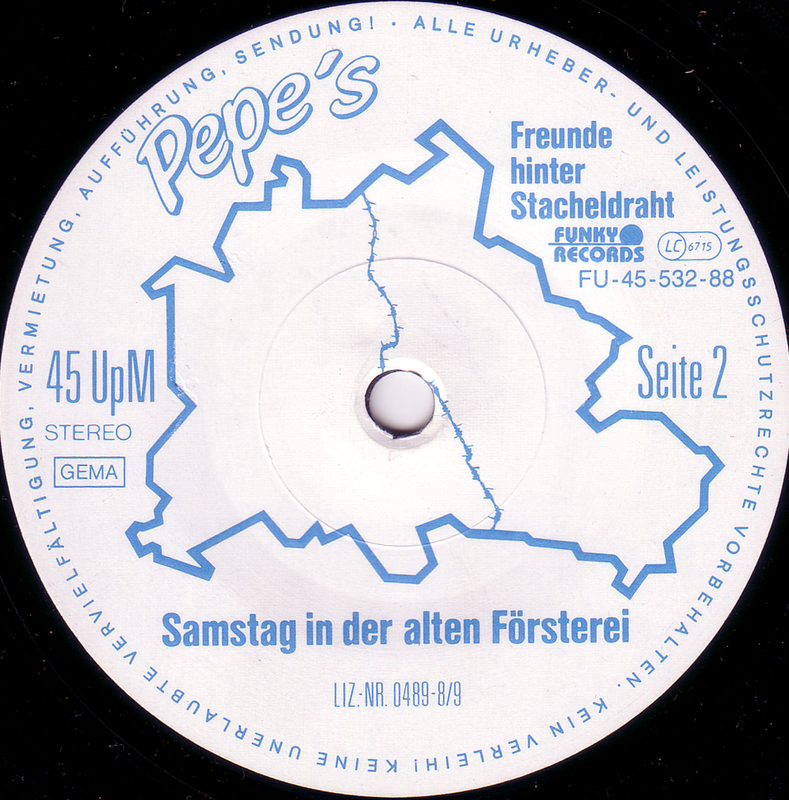 Pepe published this record one year before the Berlin wall came down in 1989. In 1988 that was a bold statement for German unity with real foresight. Nobody knew it was going to happen so fast. 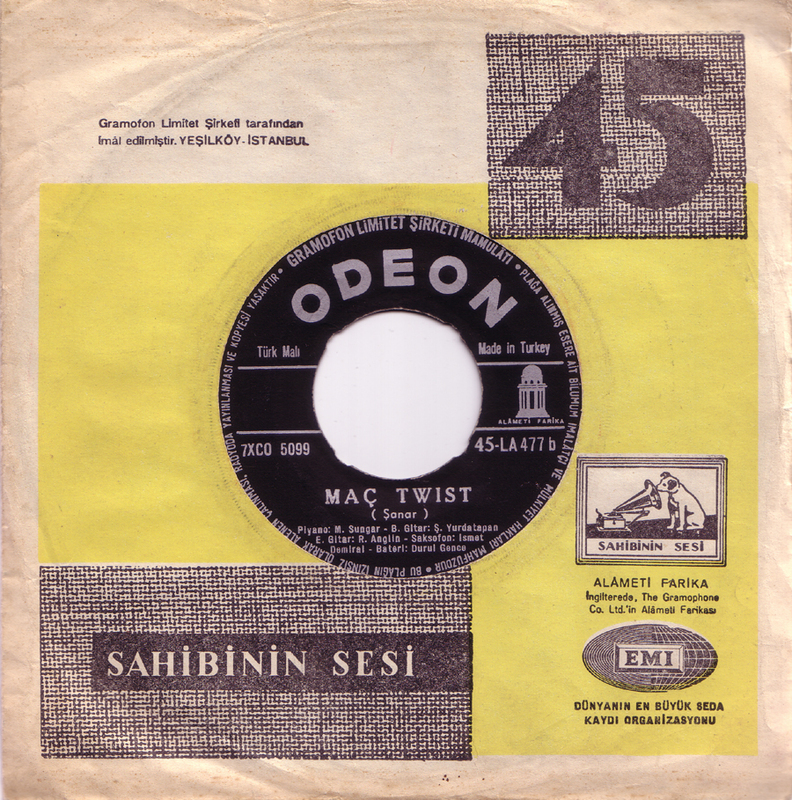 When the record came out nobody took it seriously and again one year later it`s message had become meaningless. 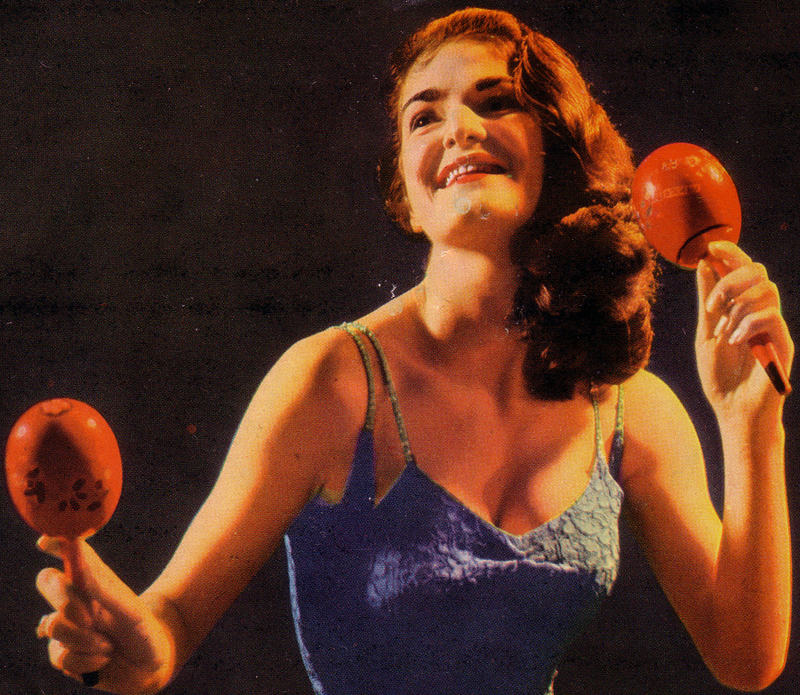 Pepe didn`t own the rights to the song and most East-German artists were prohibited to release their work in the capitalist West , but he must have thought: “So what? Sue me”. At that time the wall, that had caused a lot of people grief, made prosecution of these petty crimes pretty much impossible. Thanks to Auge, main man behind the “Renate” Comics-Library in Berlin-Mitte, for giving this to me! 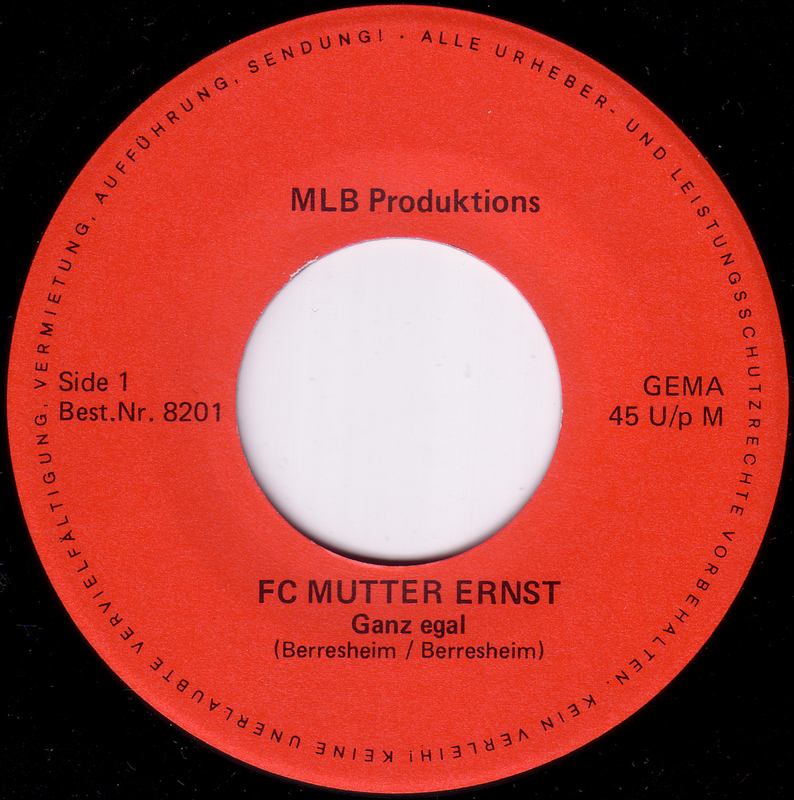 Just to show how bad ( and funny ) German football enthusiasm can get here`s a private pressing of a amateur football club or rather a bar-team, the “FC Mutter Ernst”. The songs are all about drinking and playing football. Actually they`re more about drinking than anything else. And being “the pride of the bars of the nation”. 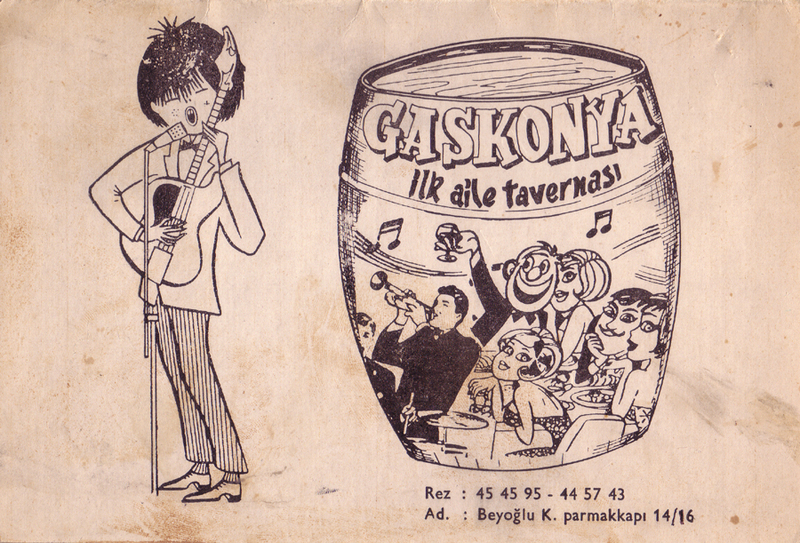 The title on the sleeve says: “Air out- Yeast in”. It seems they had fun recording their club anthems and didn`t take themselves seriously at all. I love these kind of records and it continues to amaze me what people do in their spare time. This is a typical do-it-yourself release with no other intention than to leave some trace of themselves and having fun along the way. No release date given but from the their pictures you can guess sometime in the 80s. Look what I found today at the small flea-market that is happening every Saturday down the street from where I live. 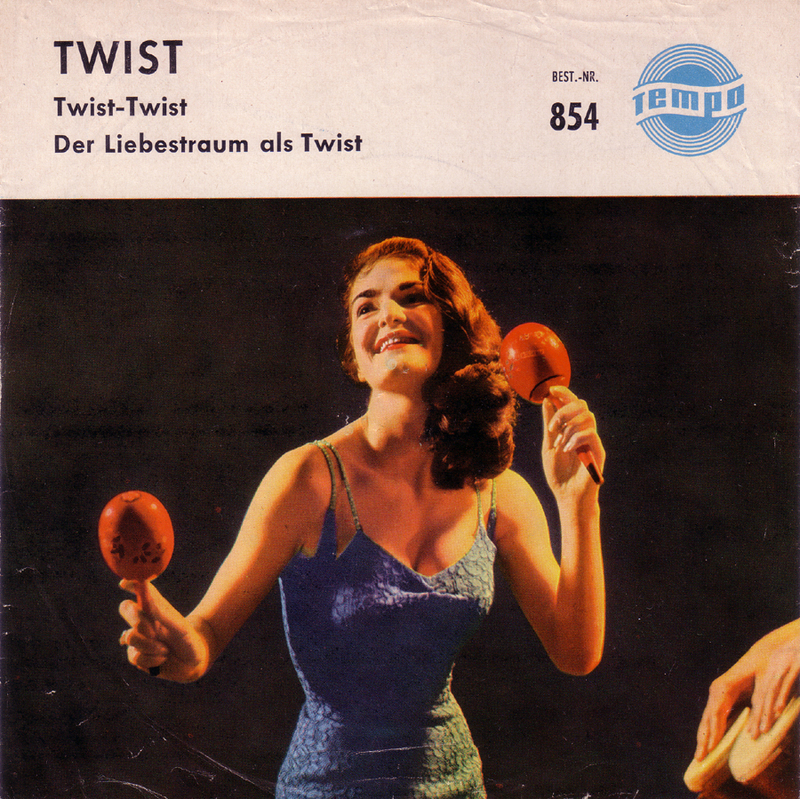 Another version of “Der Liebestraum als Twist” on the ORIOLE label from England. The record is a little beat up but it plays fine and it was only 50 cents. 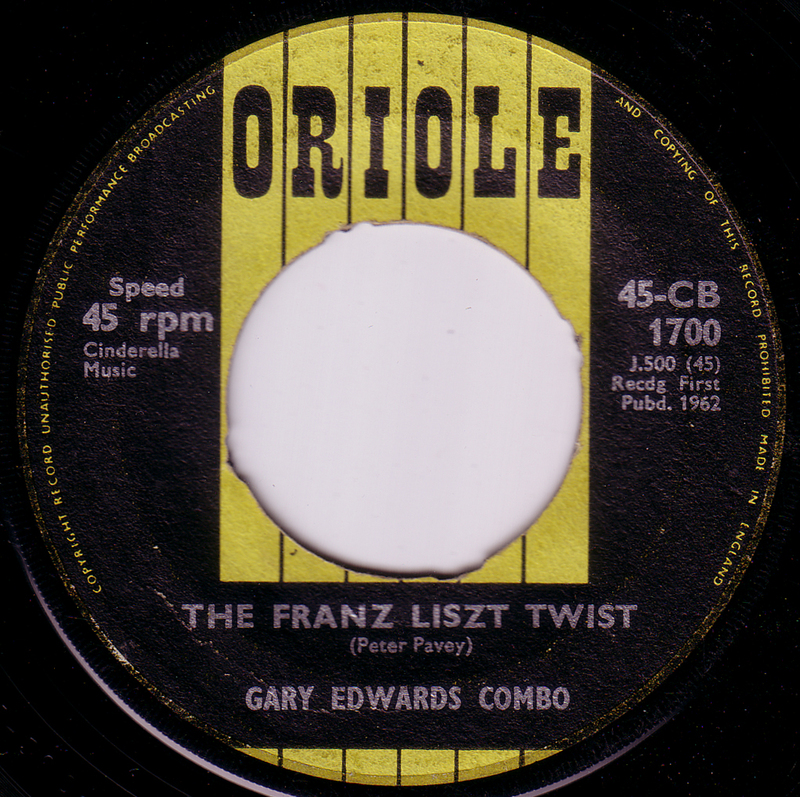 The label lists a Peter Pavey as the author of the Franz Liszt Twist but I`ll believe the original Liebestraum Twist was written by Christian Bruhn as long as somebody proves otherwise. This version has a similar intro: “Herrjeh, Herrjeh, Herrjeh, all lovers of Liszt will now twist!”. On the other hand musically this version beats the original version by a long shot. 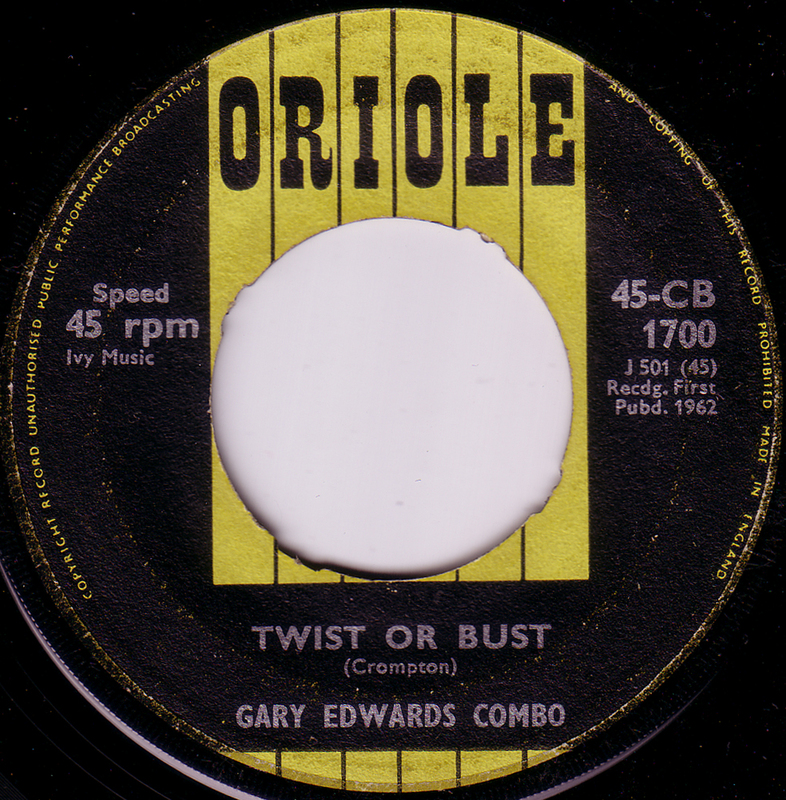 This is great rock`n`roll as is the B-Side Twist or Bust. 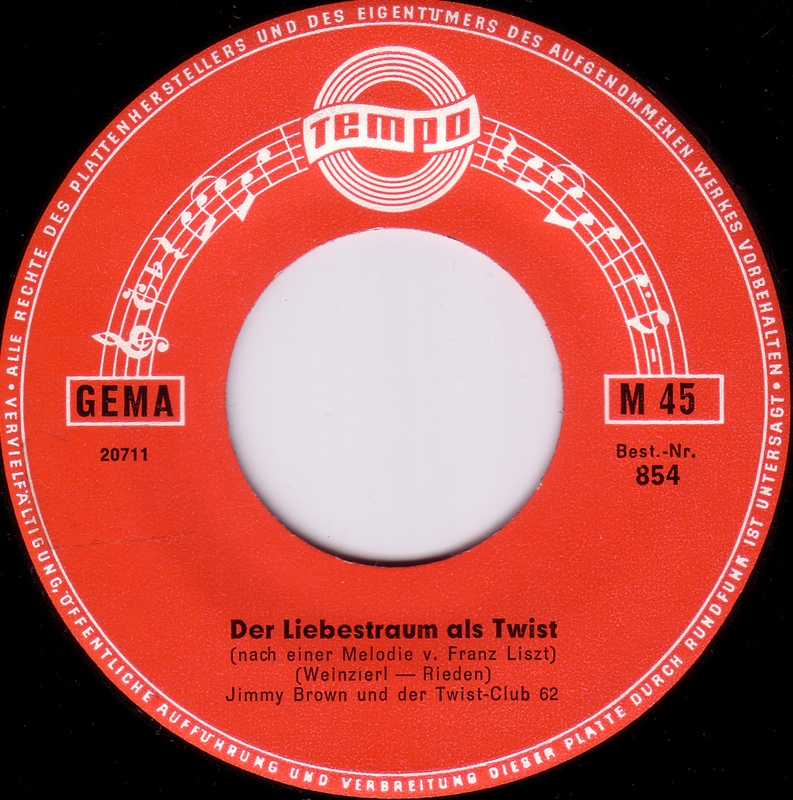 Another Tempo release, this time with a cover version of Der Liebestraum als Twist by the German band Charly Cotton and his Twist-Makers. Hey, Watch out, Brothers and Sisters! Close the Windows and put cotton in the door cracks! 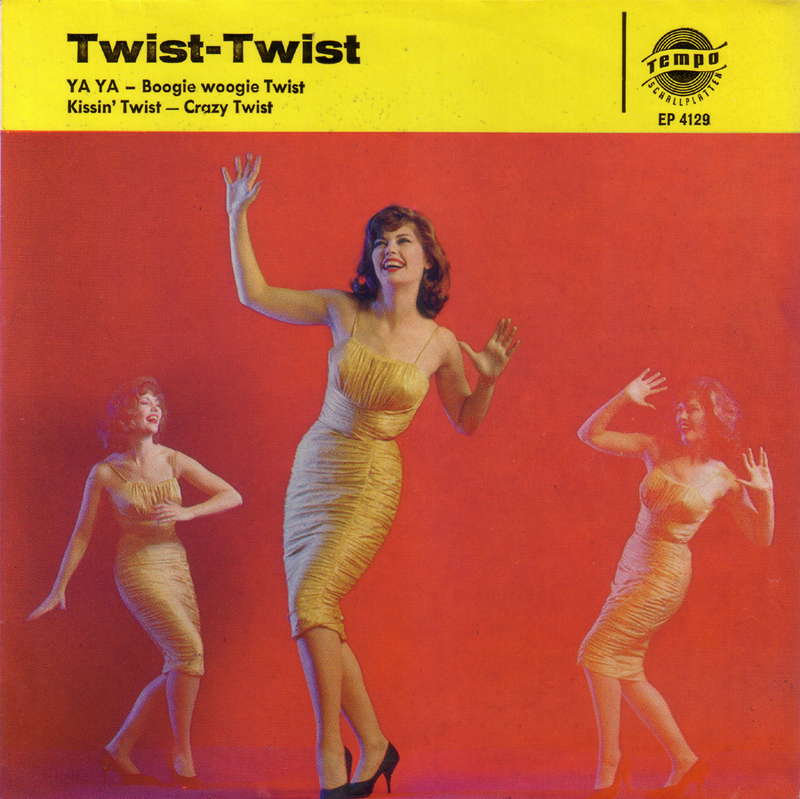 Here comes a Twist! 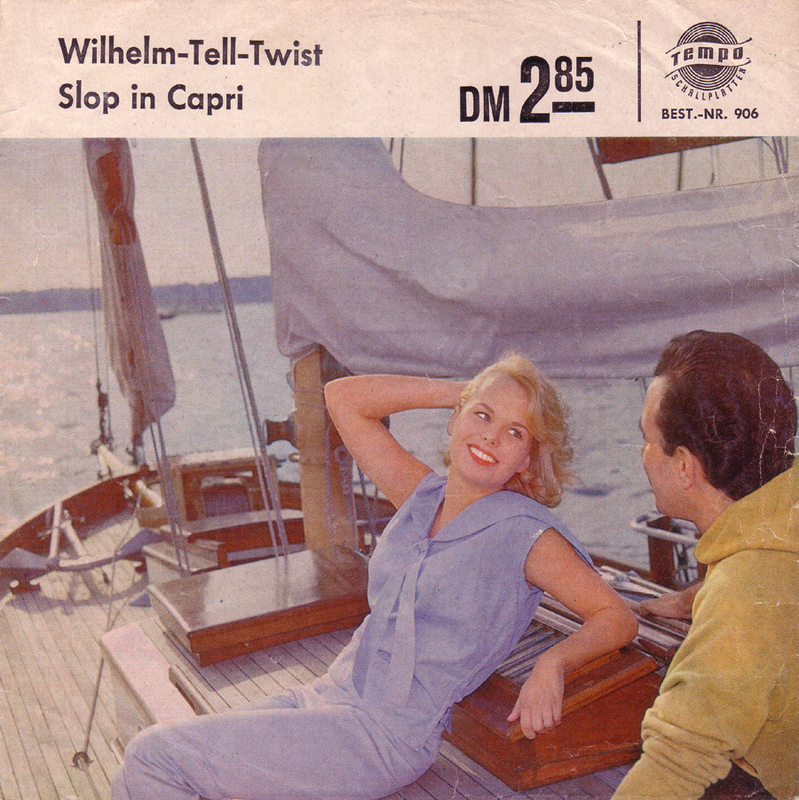 More cheapo Twists from the “Tempo” label, with another “Charly Cotton” cover, a Twist with a Swiss theme: Wilhelm-Tell-Twist. 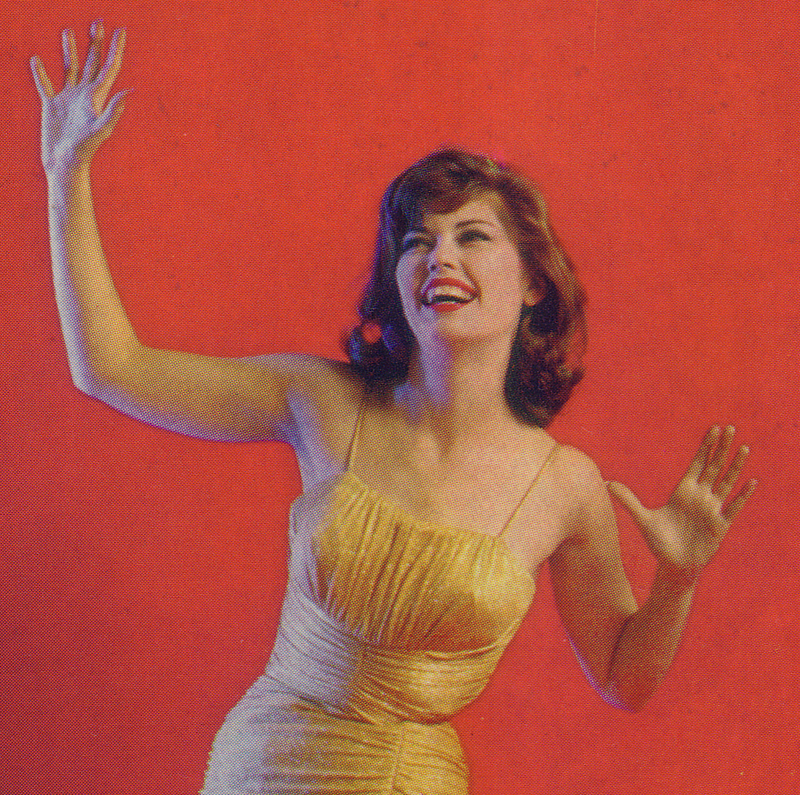 This one starts of quite similar with the singer going: “Hey, Aufgepasst! Brüder und Schwestern, das ist die Story von Wilhelm Tell!” ( Hey, Watch out! Brothes and Sisters this is the story of Wilhelm Tell! ). 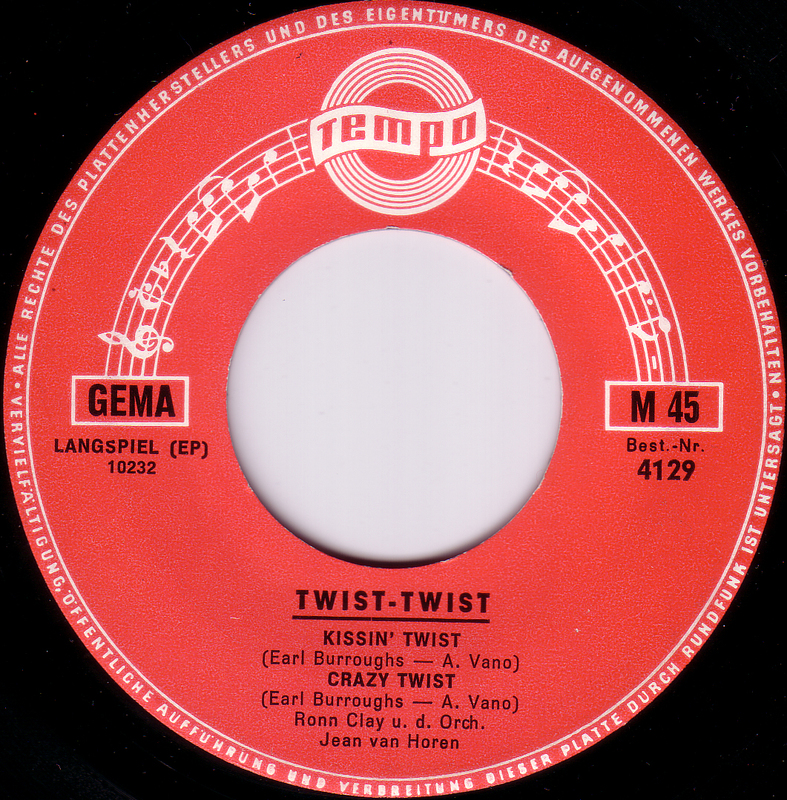 The B-Side is a cover version of Peppino di Capri`s German hit.